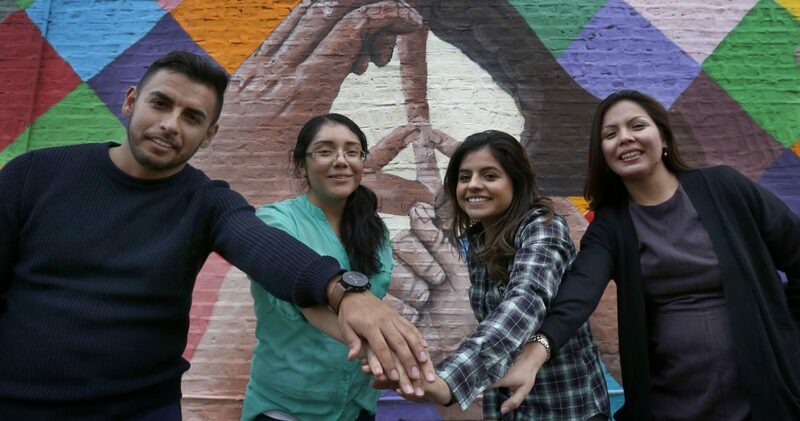 CHICAGO (CNS) — Today, 42,400 young people are able to work legally in Illinois and pay taxes through the Deferred Action for Childhood Arrivals program, according to the U.S. Department of Homeland Security. The DACA program was created by President Barack Obama with an executive order in 2012 for immigrants who were minors when their parents brought them to the United States. DACA does not give beneficiaries legal status but provides them temporary protection from deportation and gives them permission to work legally. In September, President Donald Trump announced that he would end DACA this March and he also called on Congress to come up with a legislative solution to keep the program in place. Chicago Cardinal Blase J. Cupich and the U.S. Conference of Catholic Bishops have frequently called on Congress and the president to resolve the situation. Jesus Adrian Avalos, 26, and his family moved to Chicago from Juarez, Mexico, in 2006 when he was 14. His parents moved the family because they saw more opportunities for their children and Juarez was becoming dangerous. They came with tourist visas and “just never went back,” he said. Like other DACA recipients, Avalos wanted to work and go to college. Since he couldn’t apply for financial aid because he wasn’t a citizen, he worked his way through college and earned a soccer scholarship. He now works as a web and graphic designer for the Archdiocese of Chicago. When he was a senior at Calumet College at St. Joseph in Whiting, Indiana, DACA was announced and he applied. “Now I had a Social Security number. I still wouldn’t get any help from the government, but I could pay taxes and work,” he said. Avalos earned a bachelor’s degree in computer information systems and a master’s in management becoming the first in his family to go to college and earn a degree, something his sister also is doing. He renewed his DACA status, which is valid until November 2019. He worries about his family, too. After getting a Social Security number, he was able to purchase a house for them to live in. His parents applied for citizenship 10 years ago and are still waiting. They don’t go some places because they do not have legal documents to be in the U.S. His parents pay taxes. They just don’t get any refunds. He disagrees with those who say they are taking people’s jobs. He said those who receive DACA are “model citizens,” noting that the “moment we do something wrong they take it away. DACA is a very special group. We’re in school, we’ve been in school. We’re already working,” he said. Daniela Limon has been thinking about the first teacher she had in Chicago after traveling from Puebla, Mexico, to meet her parents here. She was 10 years old and was the only student in her class who did not speak English. Her teacher was bilingual and helped her but also insisted that she use English as much as possible. When she graduated from high school, she wanted to go to art school, but her application was rejected because she was in the country illegally. She received scholarships available to students without legal documents. She studied graphic design for two years at Elgin Community College before realizing she would rather be a nutritionist. That wasn’t possible without a Social Security number, because to enter a heath care field a person must pass a background check, she said. Once she got DACA status, she transferred to a community college with a nutrition program and finished her associate’s degree. She was accepted to Dominican University in River Forest to finish her four-year degree with a scholarship. Limon hopes that whatever happens, she can continue to pursue that degree. But she also wonders about proposals that would not allow the parents of “Dreamers,” as DACA recipients are known, to get legal residency in the United States. There should be a solution for everyone, she said, with comprehensive reform of the immigration system. Limon, who lives in Elgin, said she has become more open about her status since a professor said many people don’t know they might be sitting next to a DACA recipient on the bus or in class. Most people she has encountered are open to that message, she said. And if legislation would allow these young people to have a path to U.S. citizenship, she would take it. “I want to be able to vote for my legislators,” she said. Nayeli Bolanos, 25, has a lot to lose if DACA ends. Even though she has lived in Chicago since before she was 2, she would lose a job as a medical assistant and the opportunity to start nursing school in August after completing an associate degree at the City Colleges of Chicago. She copes with the uncertainly by turning to her friends in the Catholic Dreamers Ministry that meets at a Chicago parish. The term “Dreamers” comes from a never-passed proposal in Congress called the DREAM Act — the Development, Relief and Education for Alien Minors Act — which would basically keep DACA in place. Bolanos, like many DACA recipients, she didn’t know she was in the country illegally until she was in high school and filled out forms for a driver education program. Without a Social Security number, she said, she could not get a learner’s permit or apply for a driver’s license. Then, when she realized that she couldn’t get financial aid for college or work at anything but a job that would pay less than minimum wage, she wondered why she even bothered to study in school and earn a 3.5 grade-point average. “I felt like I had my hands tied,” Bolanos said. A doctor who came into the shop asked her if she would work in a new office he was opening in the neighborhood. She explained that she was waiting for a work permit, but he hired her — at a legal wage — and she’s worked there for five years, moving up to become a medical assistant while finishing her associate degree. She hopes to become a nurse. “It’s like I’m part of society,” said Bolanos, who lives in Chicago and attends St. John Bosco Church. When she first heard Trump say DACA would end, she was devastated. Members of the Catholic Dreamers Ministry rely on each other during this uncertain time, Bolanos said. When Laura Macias finished high school and found her opportunities limited because she did not have legal residency in the United States, she moved forward at a run. Literally. Macias, now 33, was 12 when she moved to Chicago from Mexico with her mother and six brothers, ranging in age from 3 to 16. They came to meet up with her father, who was already living and working in Chicago. She was a high school junior when she realized she did not have legal status in the U.S. and learned what that would mean for her future. At first, she thought she would just get a job after graduating to help her family, but without a Social Security number, she couldn’t legally work. Macias had been a cross-country runner in high school, following in the footsteps of her older brothers, and she continued running at Morton Community College, the only school she could afford to attend without financial aid. Even so, she planned to drop out after her first year to earn money before returning. When her coach found out, he offered her an athletic scholarship to cover some of the cost. After her second year of community college, she was offered an athletic scholarship to run at the University of Illinois at Chicago. It was hard, said Macias, who lives in Berwyn and attends St. Anthony Church in Cicero. “It was Division I, so some of the people we ran against were trying for the Olympics,” she said. But she had faith that if she trained hard and did what the coaches told her, she would succeed. She graduated with a bachelor’s degree in world history. As soon as she could, Macias applied for DACA, and now works as an assistant to the admissions director at the University of Illinois at Chicago, advising prospective medical students. She also is studying for a master’s degree in literacy education. It’s especially important for her, she said, because she was able to break the pattern of generations of women in her family who stayed home to take care of the house and children. That was never what she wanted, and if she couldn’t get good paying work, she didn’t see any other option. Since Trump announced in September that DACA would end, her parents have been worried for her and her youngest brother. The other siblings have married U.S. citizens and have green cards. “The sacrifices they made for us, even working three jobs, it’s not in vain,” Macias said. The uncertainty has been hard though. She also doesn’t want to leave her family, but if it comes to it, she will find another country that will value her gifts. Duriga is editor and Martin is staff writer at the Chicago Catholic, newspaper of the Archdiocese of Chicago. NEXT: Conference examines challenges facing Catholic higher education in U.S.